Filmmakers will always be on dangerous ground when they take it upon themselves to bring a beloved children’s character to life on the big screen. 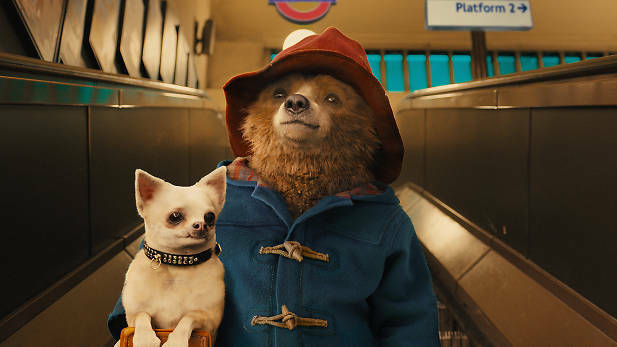 With this in mind director / writer Paul King and producer David Heyman were attempting a particularly arduous task by envisaging a real-life adventure for everyone’s favourite West London bear, in Paddington. Two Peruvian bears are discovered and befriended by an English explorer. As he is leaving to go home the explorer gets the bears to promise to find him should they ever make their way to England. Many years later following a tragic accident, the young nephew of the bears stows away aboard a ship to England to meet the explorer who changed the lives of his aunt and uncle forever. However life outside of the safety of his jungle home is not everything he expected it to be. Arriving in London the bear is befriended by the kindly Mrs Brown (Sally Hawkins), her husband (Hugh Bonneville), children Judy (Madeleine Harris) and Jonathan (Samuel Joslin) and housekeeper Mrs Bird (Julie Walters), who name him Paddington and agree to look after him until he can find the explorer he has come so far to meet. Unknown to the Brown’s and Paddington an evil taxidermist called Millicent (Nicole Kidman), working at London’s Natural History Museum, has discovered his existence and has her own reasons for wanting to meet the young visitor. Like Paddington himself, there is little to dislike about this film. One of the secrets of the original stories lasting appeal – written by author Michael Bond and first published in the 1950s – was their evocation of a London, and a group of characters, which could never have existed in reality, but which had a magical appeal for everyone. No matter how bad things got, or what predicaments Paddington got himself and his adoptive family into, you knew that everything would work out for the best by the end of each chapter. The original books (and their classic cartoon interpretation from the 1970s) were made up of a series of adventures, each forming a virtual stand alone story within the wider book, which was part of their appeal: they were ideal for a bedtime story – just long enough to hold the attention of child and adult alike, while not outstaying their welcome. An approach which may also have been ideal for the animated classics, but raised a potential difficulty where any feature length film was concerned. Would the characters of the Brown family and their loveable houseguest be enough to sustain a ninety five minute film? The answer is yes, though admittedly new characters like Kidman’s evil Millicent have been added to bulk up the plot and characterisation. One of the quirks of Bond’s stories which gave them a surreal air, was that readers never really learnt much about the other people who flitted briefly through Paddington’s everyday existence. Life revolved around him, the Browns and his friend Mr Gruber, as well as the occasional interference from their nosey neighbour Mr Curry – both of whom appear in the film, played by Jim Broadbent and Peter Capaldi respectively. However this would not be enough to sustain a major story, so here we are introduced to Paddington’s family in Peru with a back story which blends neatly with the later appearance of Millicent. Much of the film’s adult tone (subtle sexual innuendo and a story thread of taxidermy) – which has lead to criticism from some as well as its restrictive PG rating – arises from this. The whole thing is done though with such aplomb, and Millicent’s deeds are approached with such pantomime cartoon’ishness, it is unlikely viewers of any age will suffer lasting damage. Stunningly reimagined on the big screen with a cast of perfectly suited British (and Antipodean) eccentrics, the filmmaker’s have captured a period quirkiness peculiar to movies set in the UK capital which will appeal to those who remember Paddington’s original incarnation, whilst imbuing proceedings with enough of the contemporary to make it relevant to a whole new generation of young fans.